Fandom.Com, November 13, 2000: Robert Duncan McNeill: The actor-director on directing “Body and Soul,” Tom Paris and his post-Trek future. Star Trek Monthly, July, 2000: Fly Boy! Cinefantastique, April 2000: My Fair Borg: Behind the scenes of fifth season's "Someone to Watch Over Me." 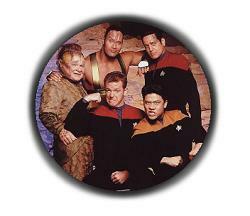 Cinefantastique, April 2000: Robert Duncan McNeill: Paris on Captain Proton and directing Trek's winning musical, "Someone to Watch Over Me. SFX Magazine, January, 2000: The Cook, The Chief, their Doc and A Lover: Guy Haley talks Trek with Roberts Picardo, McNeill & Beltran. And Ethan Phillips. Who's not a Robert, but he is on Voyager . Cult TV, Winter 1998: Delta Flyers: As Voyager inches ever closer to home, Roberts Picardo and Duncan McNeill talk about the way forward. Soap Opera Digest, July 1993: Easy Rider: It’s a long way from Pine Valley to Jantique, but for Robert Duncan McNeill, the path has been smooth. Tiger Beat: Star, September, 1987: Robert Duncan McNeill: Not Just Another Singing Soaper!